This is the second recording of this lineup, the first being last year’s Electric Fruit (also on Thirsty Ear), and like the former record, this one too reflects a commitment both to delicate, intricate interplay and heavier, rock-influenced gestures. The work of guitarist Halvorson and trumpeter Evans should be familiar to the readers of this blog, as Halvorson’s had a number of stellar recordings over the past few years (2012’s Bending Bridges being particularly outstanding), and Evans’ work with Mostly Other People Do the Killing (amongst other projects) has been consistently creative and genre-defying. Walter is a veteran of the Flying Luttenbachers, among other groups, and thus brings a noisy propulsion to his work on this disc, in the process pushing Halvorson and Evans to explore the more aggressive side of their playing. The result is an enjoyable and engaging disc, of particular interest to those listeners willing to let their hair down a bit and rock out. This is not to say that everything here is loud and intense, as some of the more interesting moments are ones in which all three musicians explore more subtle terrain. 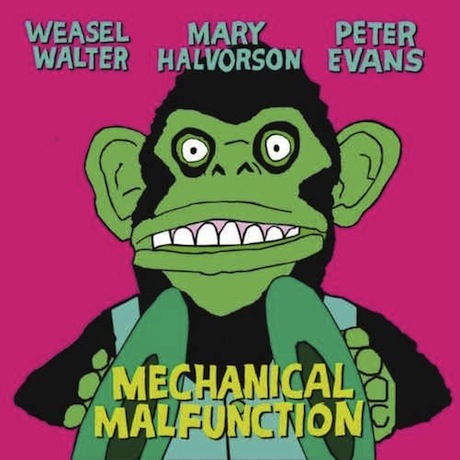 The opening cut, “Baring Teeth,” is an especially good example of a strong piece of group improvisation involving Halvorson’s trademark bending lines and Evans’ fluttering passages and assorted growls, while Walter fills in the gaps with a variety of ideas on the drums in a relatively understated way. 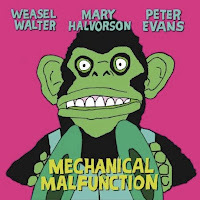 But when the group does decide to rock out, as on the second track, “Vektor,” or “Interface,” Halvorson pushes the distortion into overdrive and Walter starts pounding, with Evans taking an equally brazen turn, as he’s more than capable of holding his own through the barrage. The results are frequently invigorating and powerful. Editor's note: Mary Halvorson will be performing at JACK New York (Brooklyn) on January 28th with Ingrid Laubrock and Jon Irabagon. For more info. I am willing to let my hair down and rock out with them - one of my favorite trios in free jazz. I really like this music in the twilight zone between rock and free jazz and the three of them are masters of this "genre". As usual a really nice, thoughtful and well-written review, Troy. Thanks, Martin. I don't know if you heard much of the Ballister record from last year--but it's got plenty of rocking moments as well (thanks in large part to Nilssen-Love's amazing drumming). I would characterize it as more of a "pure" free-jazz record than this one. But it's really outstanding, IMO. Seconding the Ballister recommendation (Mechanisms-I haven't heard the first one). And I'm a huge fan of the the first album from this trio. The cover art I'm not so sure about! I don't know why Ballister slipped off my radar. I just bought it, I am listening to it right now and it is totally great. And I even like the cover art.